I am still trying to figure out how to manage my life in Philadelphia, so I sometimes get my groceries delivered from an online service. Frequently, I end up with far too much of something. Right now, it’s rhubarb. But a few weeks ago, it was taro. Whenever I buy those bags of assorted root vegetable chips, I always love the taro chips the most. They’re the white ones with almost purplish-looking squiggles. There are never enough taro chips in the bag, especially when my sister is around, because they’re her favorite too! 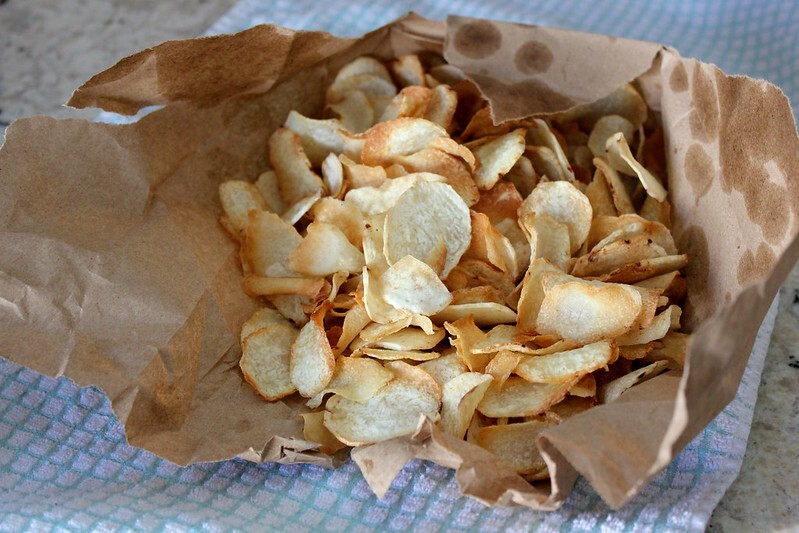 I saw taro was available from my online grocer and thought I’d try making chips for my sister. But the taro was priced by the pound, confusingly cheap, and I ended up with too much…too much. Fortunately, the chips are delicious!! 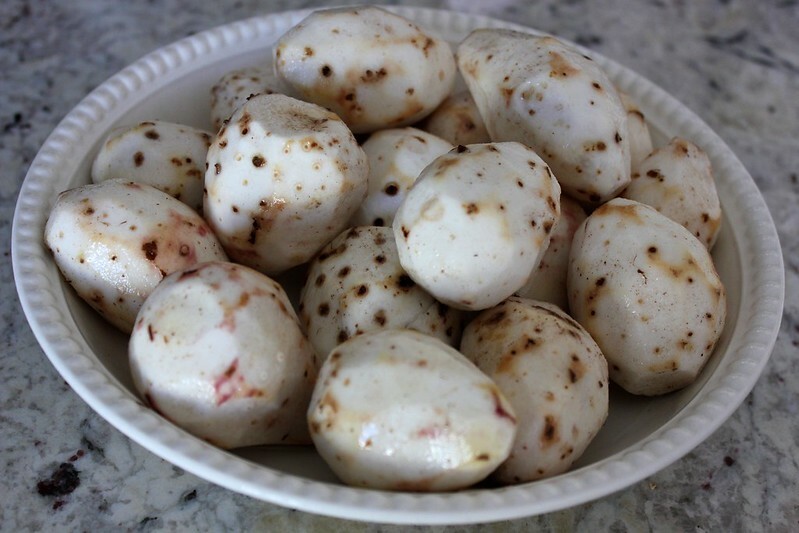 Get a bunch of taro. It’s pretty hairy and coconut-like on the outside. Peel the taro using a vegetable peeler. This is the most difficult part of the whole process, because the taro flesh is really slippery. Rinse the taro off. Since the taro are so slippery, I don’t recommend slicing them manually. 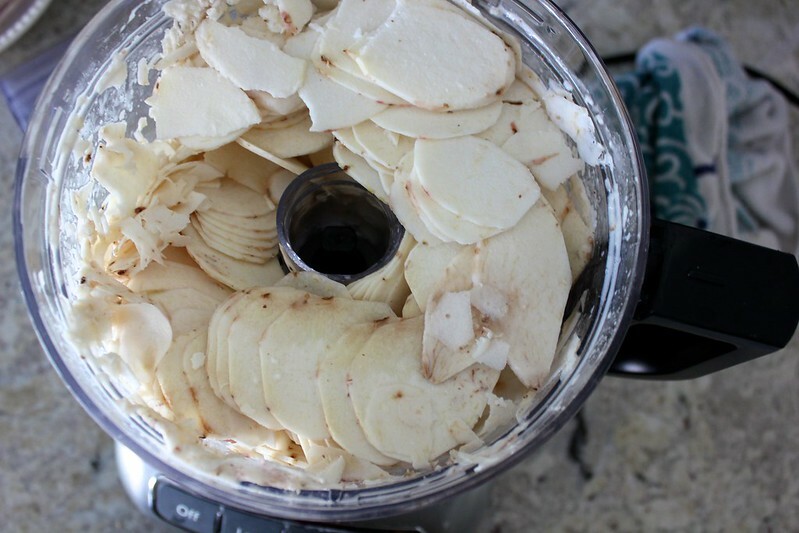 Instead, use a food processor’s slicing attachment, adjusted to the thinnest setting, to slice the taro into chips. It’s super fast and easy and makes up for all that time spent peeling! 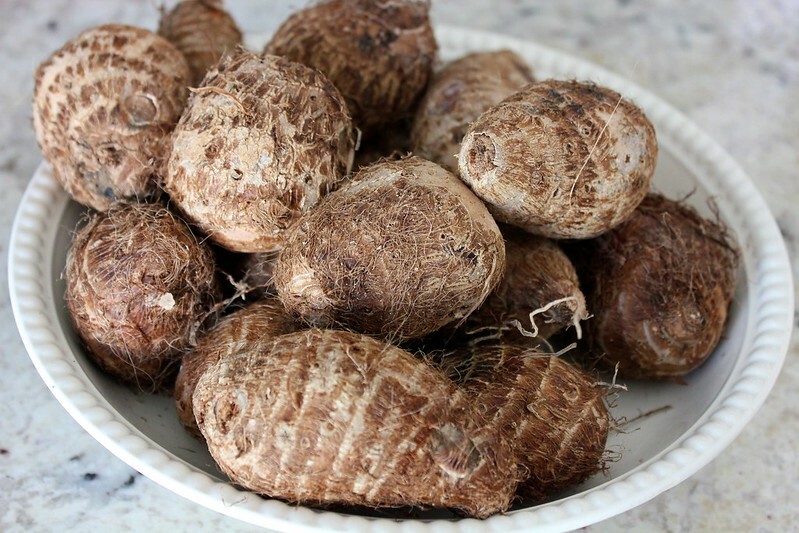 The taro is so slippery because it is full of starch. 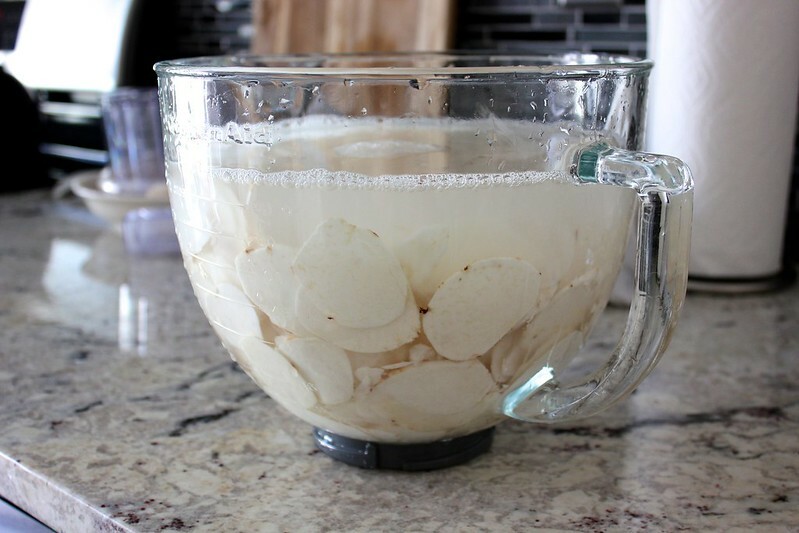 To prevent the taro chips from sticking together during frying, let them soak for a bit in a large bowl of cold salt water. The salt water will flavor the taro chips and rinse off the excess starch. It’s important to dry the taro thoroughly before frying it. Spread the taro evenly between layers of paper towels to get the job done. Heat about 1 inch of oil in a cast iron skillet over medium/medium-high heat. Grapeseed oil is great because it isn’t prone to smoking. 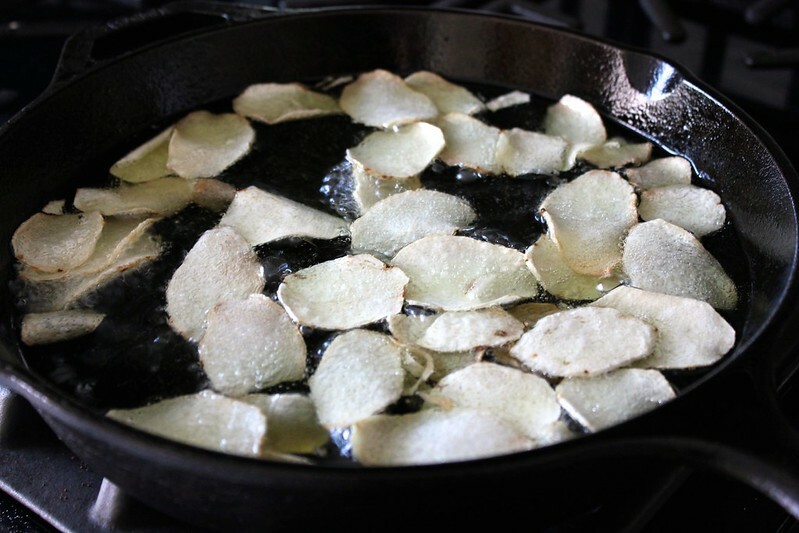 It’s expensive, but when you’re done frying, you can strain it and use it again and again. When a small bit of taro sizzles as soon as you drop it in the oil, you’re ready to start frying. 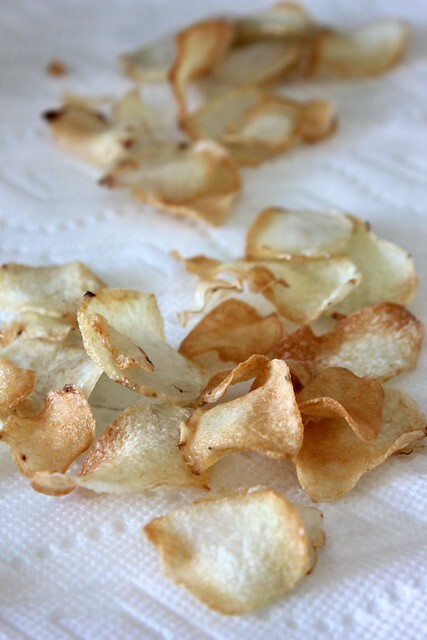 Drop a large handful of the taro chips into the oil, and give them a stir to spread them out. 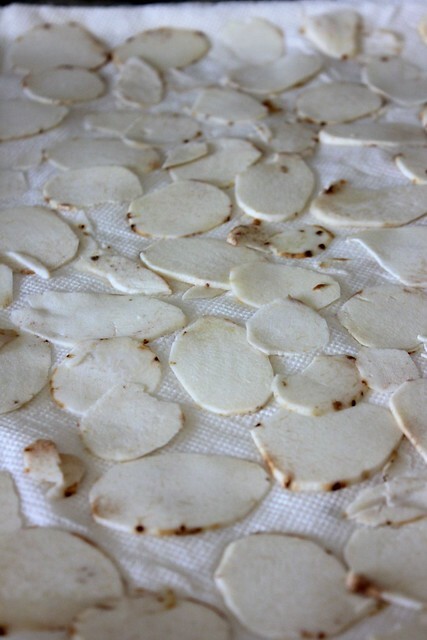 When the taro chips have lightly browned around the edges, remove them with a mesh skimmer, and transfer them to a paper towel-lined baking sheet to drain. If you want to salt them more, now is the time to do it. 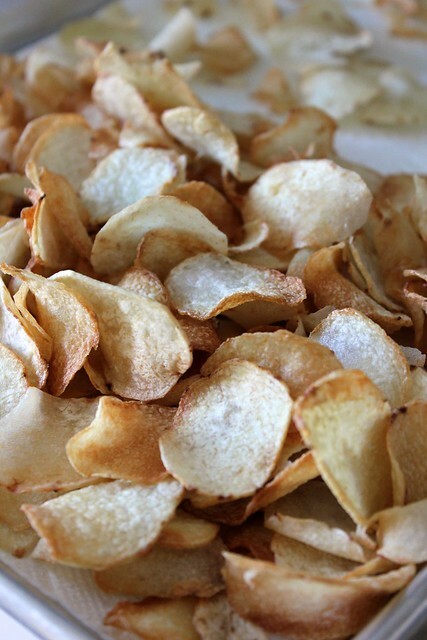 The taro chips will crisp up as they cool.